If found a great little write-up on something I had been meaning to jot down for some time. It’s all about tmux and how to really take control of your experience while using it. Tmux is great. I really enjoy using it when spending time in the terminal. There are a ton of things you can change in your config file to really make it yours when using tmux. Check out Hermann Vocke’s post on making tmux pretty and usable. Using Hermann’s post, I’ve made my own tmux config changes. The most common stuff to change in your tmux.conf file is the prefix key. The default for this is C-b which is odd to type every time you need to send the prefix. I prefer mine to be C-z. For some reason, the default split screen shortcuts are crazy. Who wants to type C-z " to split vertically and C-z % for horizontal? What? That’s dumb. There’s a simpler way. Might as well make it easy to reload your tmux config anytime. Changing the view is a frequent thing you do once you start working in tmux. Why not make it super-fast? If you’re going to spend time there, it might as well look great. I really like the color scheme Hermann uses. Please read Hermann’s post, it really does a great job of explaining the things you need to be aware of. 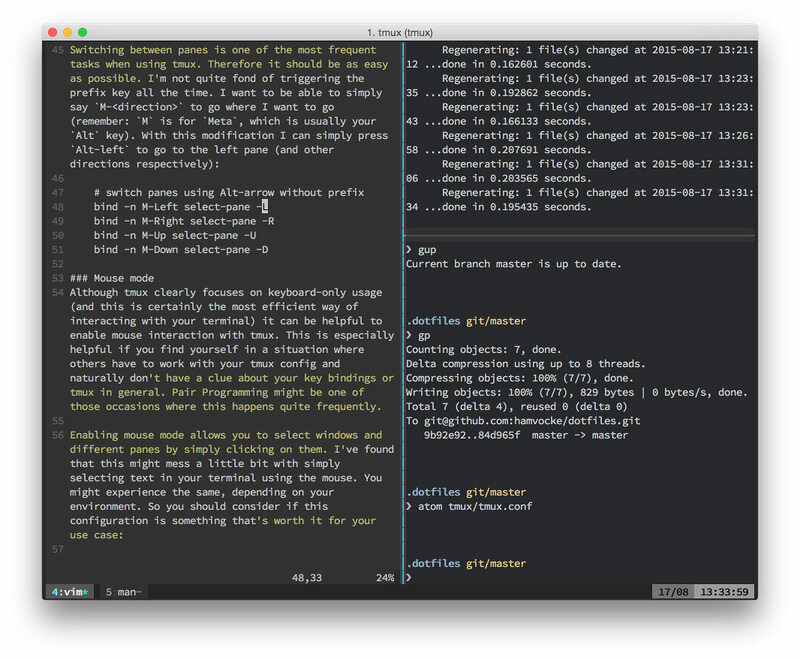 Customizing your Tmux .conf file was published on July 19, 2016 .